British created the largest empire in history of the world. It was spread over all continents of the world. But India was the largest colony and was considered the Jewel in the Crown. This vast country was divided into eleven provinces directly ruled and administered by the British. However, a large part of India was only indirectly ruled by India and was under the control of local rulers, considered princes, working under the umbrella of a paramount power. The above maps shows that almost a quarter of Indians lived in princely states, which occupied over a third of the land mass of the Indian sub continent. Number of these states was about 565 (I saw a list of 638 states or estates), but most of them were very small. About 200 of those had an area less than 25 kms square. Of these states about 45 were significant for Muslims in many ways. Some of them were ruled by Muslims or had a population in which Muslims were in a majority. I have divided them into three groups. 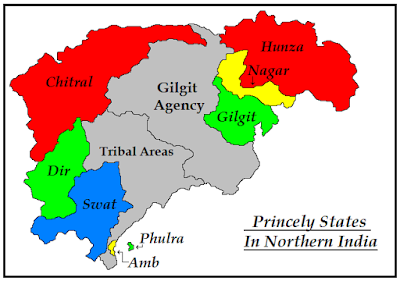 Of these 14 states and tribal areas joined Pakistan after the independence. While parts of State of Jammu & Kashmir also joined Pakistan. The following map shows the location of some of these states in northern India, while the other states can be seen in the main map given above. Punjab also had many princely states and five of these were ruled by Muslim rulers. But only Bahawalpur joined Pakistan. Other four states Maler Kotla, Loharu, Dujana and Pataudi were non contiguous to Pakistan so could not join it in 1947. 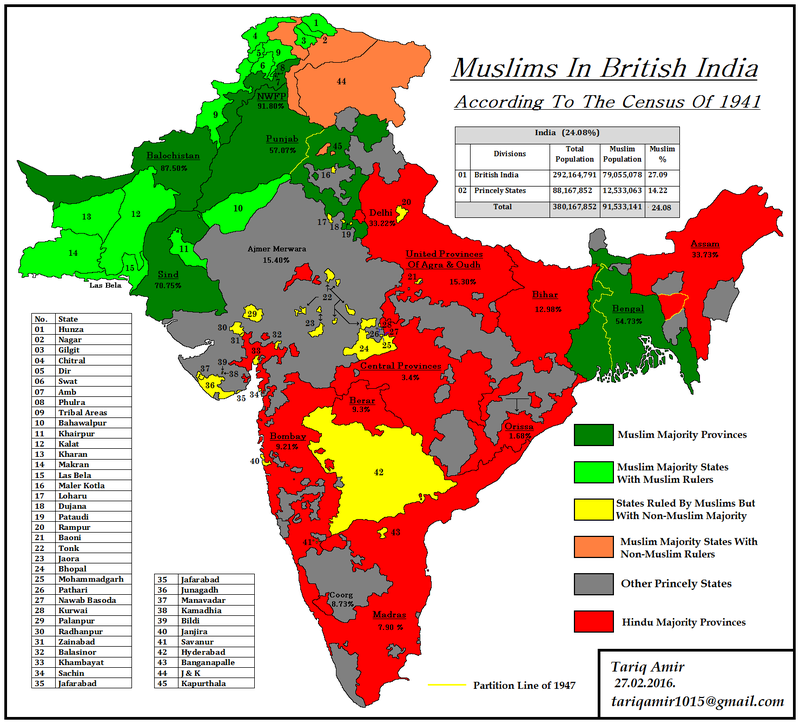 Moreover, most of the population was non Muslims. 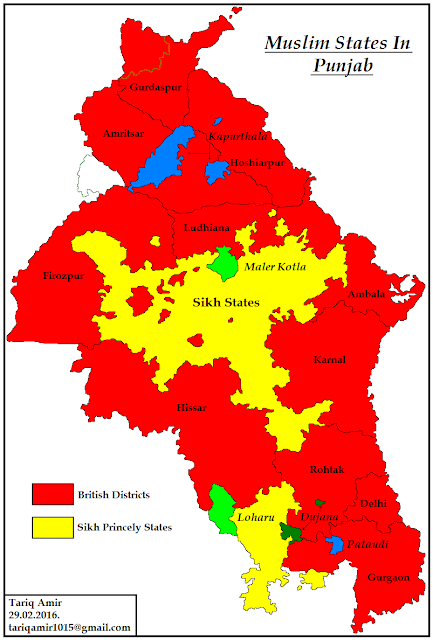 Kapurthala was unique in the sense that in eastern Punjab it was the only state which had a majority of Muslims, but was ruled by a Sikh ruler. It was contiguous to Muslim majority areas of Ferozepore, Jullundur, Gurdaspur and Hoshiarpur, but when these areas were unfairly granted to India, the state of Kapurthala itself fell into India. 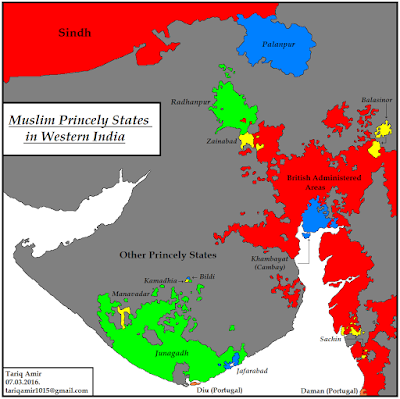 Another group of 11 Muslim princely states was in the western India, in the province of Bombay. These all states were predominantly Hindu. 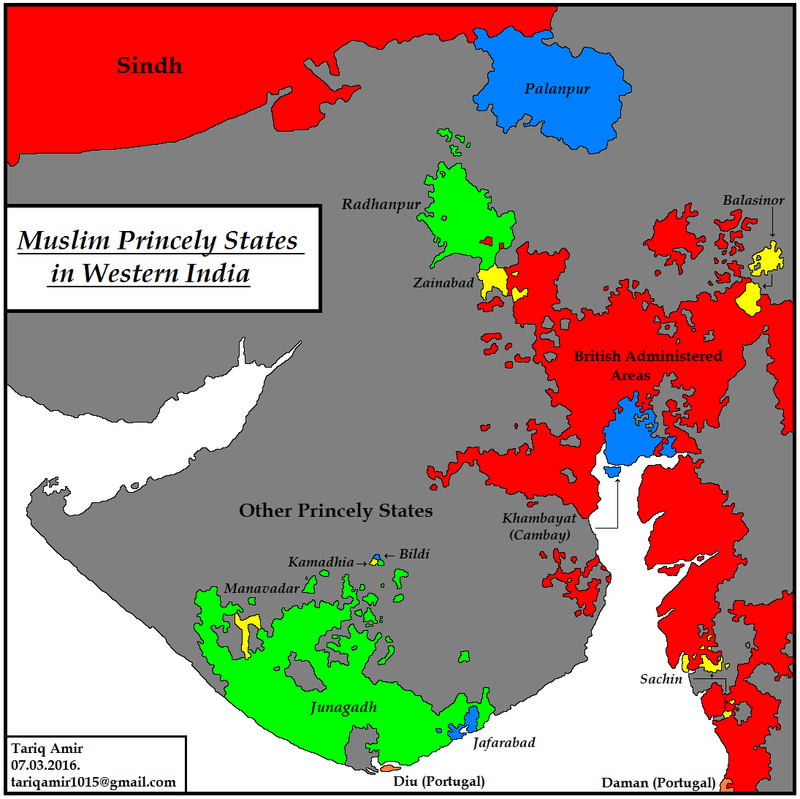 Junagadh was the biggest of all these states and at the time of independence tried to accede to Pakistan. But later on India intervened and annexed it. 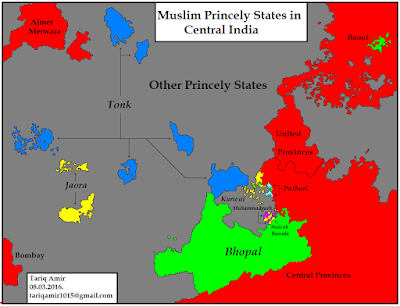 Central India also had a cluster of 8 Muslim princely states. Bhopal was the most important of all these states. After Hyderabad and Bahawalpur it was the third biggest princely state ruled by a Muslim family. 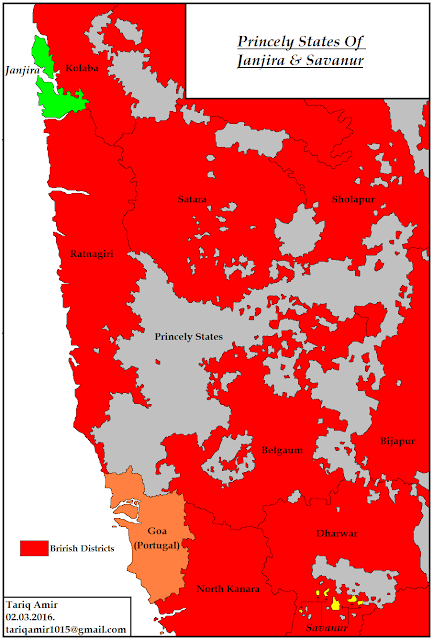 The following map shows two Muslim princely states of Janjira and Savanur in the Maratha heartland in western India. Bigger states like Hyderabad, Jammu & Kashmir and the states of Baluchistan can be seen in the main map. I have not written the history of these states or details of their rulers. My only purpose was to give their accurate maps and location. 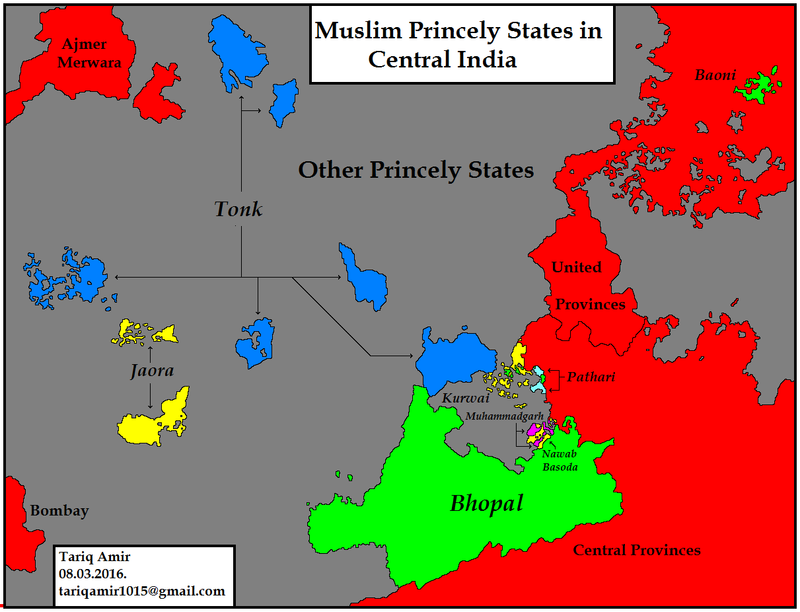 However, readers are welcome to add or correct any information about these Muslim princely states. Tariq AmirMarch 15, 2016.Doha - Qatar .